European researchers have used a computer to design small synthetic molecules capable of attacking the deadly AIDS virus where it hurts the most: its ability to produce the genetic material required for replication. It's the first time in history this has ever been done. To date, HIV/AIDS has killed more than 28 million people worldwide. 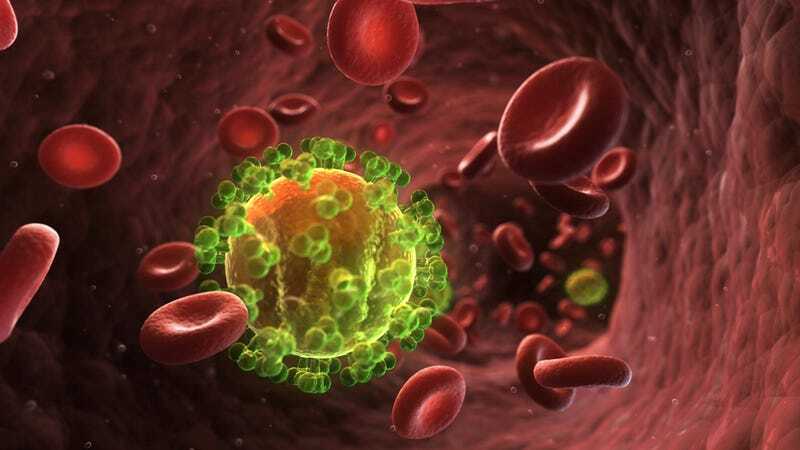 While a new HIV vaccine shows promise, this is of little consolation to the 34 million people currently living with the virus. In an effort to treat ongoing infections, pharmaceutical companies typically focus on medicines that act on target proteins, but the HIV protein has long been considered one of the most difficult targets in all of structural biology, mostly on account of the wildly complex way its receptors are made from RNA. Seeking a different angle, scientists from several Spanish universities and research centers took to their computers in hopes of designing a new synthetic chemical capable of joining — and then sabotaging — an RNA target. And this is precisely what they did. The novel designer molecules work by blocking the virus' ability to replicate. And they do so by inhibiting the output of genetic material from the infected cell nucleus to the cytoplasm. Without replication, no new infections can occur. So in theory, because all cells are mortal, even the infected cells will eventually wither away and die. Normally, the replicative genetic material of the AIDS virus, or HIV-1, is formed by ribonucleic acid (RNA). This critical genetic material encodes for special proteins that allow it to penetrate human cells and then reproduce within them. But the new designer compound, a virus inhibitor called terphenyls, reproduces the interactions of one of the proteins encoded by the virus — a viral protein called Rev. These terphenyls have the nasty habit of acting like an unwelcomed guest in the Rev's receptor within the viral RNA. And because three's a crowd, this prevents the proper interaction between the protein and its RNA receptor. The virus's replicative ability is broken — the proper interaction required for the virus's genetic material to leave the infected cell is prevented. And with no replication, no further infections of neighboring cells can occur. After designing the compound on the computer, the scientists synthesized the molecules in the lab. Then came the moment of truth: Testing the mixture on a real infected cell. And it worked, confirming the validity of the models generated by the computer. The next step will be to improve the pharmacological properties of the new Rev inhibitors and work towards actual clinical applications. Encouragingly, the terphenyl structures identified in this research could open new ways to approach other therapeutic targets. Read the entire study at Angewandte Chemie International Edition: "Structure-Based Design of an RNA-Binding p-Terphenylene Scaffold that Inhibits HIV-1 Rev Protein Function".